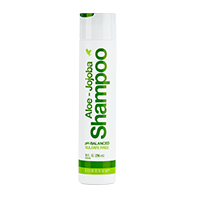 Get beautifully shiny and easy-to-manage hair with this aloe vera and jojoba oil-infused shampoo. Its ingredients remove oils while simultaneously soothing your scalp, and the new formula also contains Lavender Forever Essential Oils. The gentle pH-balanced formula is suitable for all hair types and can be used to help replenish your hair’s natural moisture.